These 3 filters are available in Kdenlive. Wanted to make them available to Shotcut users. Threshold This one is key framed. Thanks. Is Threshold under a different name in Kdenlive? By the way, we should make sure to keep track of all filters being posted that way each can be properly tested and fine tuned before sending them off to Github to be included in an official Shotcut release. I believe that with these 3 right here there have been 12 posted so far. We should pace ourselves. Is Threshold under a different name in Kdenlive? Not sure what you mean. Threshold in Kdenlive is in the artistic group. There are 2 thresholds in the MLT filters. Threshold0r and plain Threshold. There are a few more I looked at in Kdenlive that might be worth adding to SC. I couldn’t find it at first in Kdenlive when I typed that message but now I see it. And that’s a great thing. All mean is that since we already have a dozen or so it’d be good to get at least most of them ready to be sent to Github to be officially put in Shotcut before exploring more so as to not lose track. I put all 12 user created front ends for filters on google drive. 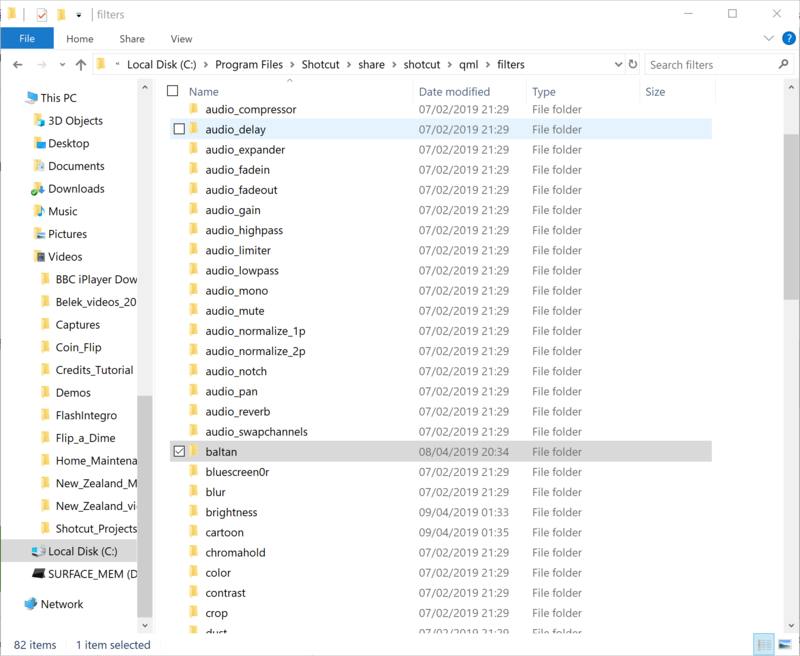 All the folder names are prefaced with 00 to differentiate between the filters that come with the standard Shotcut installation and the filters that are added by the user. Users can install the filters they wish to test by downloading and adding the folder to their Shotcut installation. Been away for a few days and missed lots of activity on this forum. I will try them this week. Thanks again. I do not know if it’s a silly question, but where should I place these folders with the filters in W10 so that Shotcut can detect these add-ons? Your Shotcut install drive in the filters folder. I must copy the folder (example 00 baltan) or just the two .qml files, inside that path.? Oh and thanks for the quick response. Copy the folder and paste it into the path. Yes, I saw it right away. Thanks again. I was mistaking the route. You might want to keep a copy of the filter folder elsewhere as well. 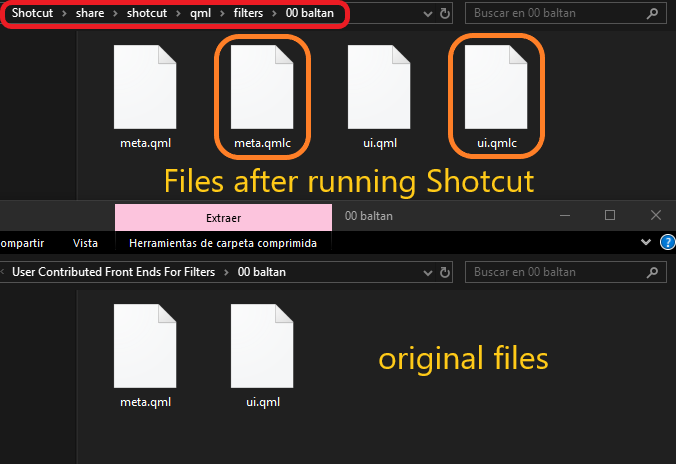 If you reinstall Shotcut with the option to remove old program files all the files are erased and you’ll have to copy the filters back. Yes, I understand that this is a manual installation. Copy and paste. I already saved this filter folder in a safe place. I tried the new filters to make sure they worked on my copy of Shotcut. Now in those folders, two new .qmlc files were created. This is great and expands the creative possibilities of Shotcut. Many thanks to the users who have developed these filters. Yes, in my case, each folder with filters that do not include Shotcut in the installation has a name preceded by 00. A quick way to locate these folders. A new filter for people to play with - sobel. The Sobel effect is an edge detection algorithm that creates an image that emphasizes edges. Running SC on a Mac? I see that on Mac it automatically creates the .qmlc files (assuming qml Compiled) but not on Windows. The filters are compatible with any of the three OS’es even though the .qmlc files aren’t created. Shotcut is running on W10. In the screenshot, I used the baltan filter as an example. In red, the path where the filters are located.